Prepare to fall in nori-coated love because Brisbane's fancy new sushi train is sure to be your new favorite lunch hang. Having opened its doors only a few weeks ago this new, spacious and beautifully designed sushi train has already captured the hearts of many Brisbane foodies. It's by no means your typical sushi train. 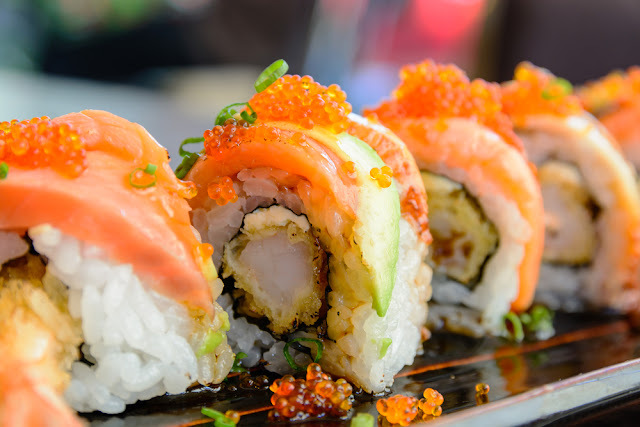 Sushi & Nori are serving up nothing but the best with their flavourful fusion rolls. All produce is super fresh and of the highest quality like their premium Tassie salmon. Oiishi has long held a special place in our hearts and the hearts of Sunnybank locals. You'll be pressed to find a time where they arent bursting with customers and for good reason. Oiishi is serving up some of the most innovative and delish fusion rolls in Brisbane. Our personal favs are the Dynamite Rolls ( Salmon and cucumber wrapped in pink soy skin, dressed in Oiishi's famous Dynamite sauce) and the Snake Roll (Medium rare salmon, tobiko and avocado wrapped in salmon skin tempura, dressed in wasabi mayo). Five words: ALL. YOU. CAN. EAT. SUSHI. Yes along with delicious hot pot, guests of Shabuhouse are treated to a smorgasbord of freshly prepared sushi! The variety is amazing and the sushi is constantly replenished throughout the day. If you consider yourself a die hard connoisseur of sushi then this is one buffet you NEED to try. Sunnybank is home to many quality sushi restaurant, but Sushi Edo stands above the rest. You'll find a mix of your beloved classics as well as some innovative fusion rolls like the "Cheetos Roll"...you'll just have to try that one for yourself! Last but not least, Izakaya Wagaya in the CBD. Izakaya is the most classic sushi restaurant you'll find on our list. Its a popular lunch hang amongst the city folk for their quality and consistency. You won't leave disappointed with their classic and extremely fresh rolls!